Section 29A of the Insolvency and Bankruptcy Code, 2016 (“the Code”) has emerged as one of the key statutes in determining the eligibility of Resolution Applicants in the Corporate Insolvency Resolution Process (“CIRP”). The Code, in its original form had not incorporated any provisions to prevent defaulting promoters from buying-back the corporate debtor, which could occur potentially at steep discounts. Subsequently, through an amendment to the Code, Section 29A was inserted with retrospective effect from November 23, 2017. A second amendment to the Code, effective from June 6, 2018, included amendments to Section 29A. 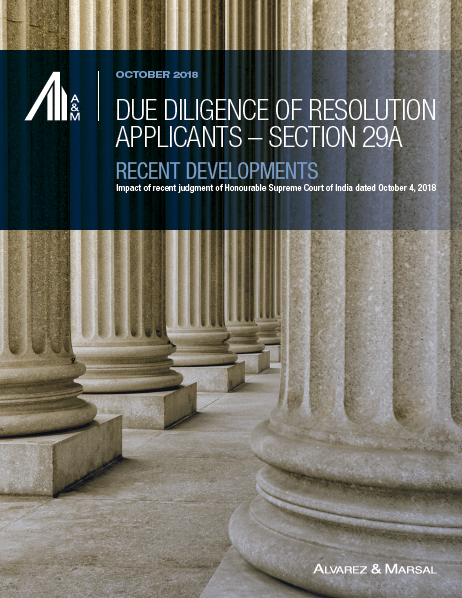 Regulation 36A(8) of the CIRP Regulations, among other things, requires the Resolution Professional to conduct due diligence of the prospective Resolution Applicants under the provisions of Section 29A. The most recent Judgment dated October 4, 2018 of the Honourable Supreme Court of India, explains and reinstates the importance of conducting a thorough due diligence under Section 29A. As noted by the Honourable Supreme Court of India, “great care must be taken to ensure that persons who are in-charge of the corporate debtor, for whom such resolution plan is made, do not come back in some other form to regain control of the company without first paying off its debts.” The Supreme Court judgment also asserts that the Resolution Professional needs to confirm that a resolution plan, among other things, does not contravene the provisions of Section 29A.